CABLE HIGHLIGHTS: The night’s actual top-rated original was the primetime part of TNT’s NBA DOUBLEHEADER, 0.74 for Lakers vs. Cleveland, with 0.52 for the later Houston vs. Portland game. 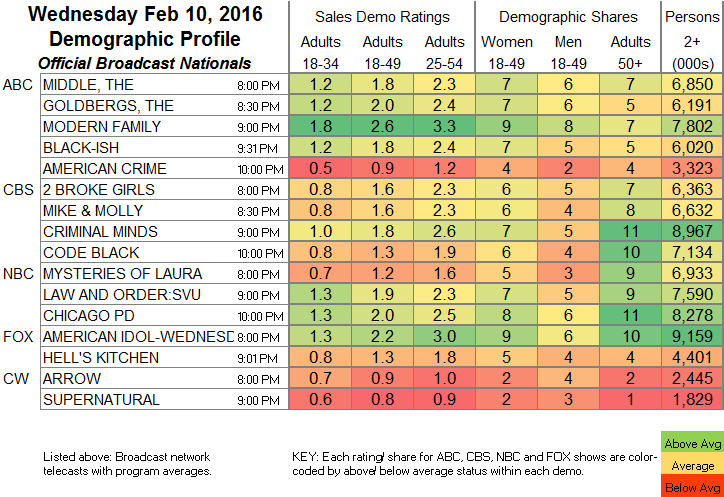 On A&E, DUCK DYNASTY lost a tick to 0.58, and JEP & JESSICA fell 0.09 to 0.45. On History, AMERICAN PICKERS was up 0.03 to 0.58, PAWN STARS lost 0.07 to 0.52, and AMERICAN RESTORATION was at 0.32. On Lifetime, LITTLE WOMEN LA was up 0.04 to 0.57, and LITTLE WOMEN ATLANTA rose 0.08 to 0.50. VH1’s MOB WIVES climbed 0.09 to 0.57. USA’s SUITS edged up 0.03 to 0.51. HGTV’s PROPERTY BROTHERS gained 0.07 to 0.47, and HOUSE HUNTERS was up 0.02 to 0.42. 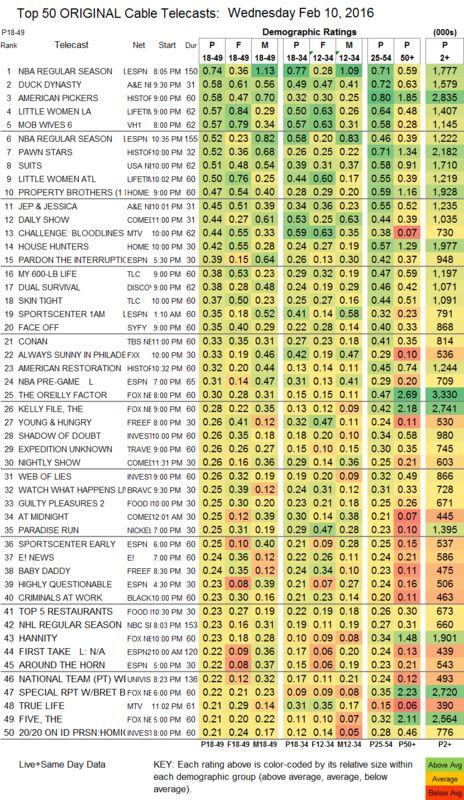 MTV’s THE CHALLENGE fell 0.07 to 0.44, and TRUE LIFE was at 0.21. On TLC, MY 600-LB LIFE shed 0.14 to 0.38, and SKIN TIGHT slipped 0.03 to 0.37. On Discovery, DUAL SURVIVAL added 0.03 to 0.38. Syfy’s FACE OFF ticked down to 0.35. On FXX, IT’S ALWAYS SUNNY IN PHILADELPHIA dropped 0.04 to 0.33, and MAN SEEKING WOMAN (not on the chart) fell 0.04 to 0.10. On Freeform, YOUNG & HUNGRY lost 0.04 to 0.26, and BABY DADDY was also down 0.04 to 0.24. On TV Land (and only TV Land), YOUNGER fell 0.04 to 0.17, and TEACHERS was down 0.02 to 0.15.